Our hands play an integral part of our daily lives. We are always using them to complete a variety of tasks. I think it's time to show better care to our hands and nails. The best way to achieve this is with a manicure. Whenever people the hear term 'manicure' they envision French tips whereas a manicure is simply the basic care and treatment of your hands and nails. I will be guiding you through a step-by-step tutorial on how to give your nails the attention they need. 1. The first step is to rid your nails of any nail polish or dirt. I used the Cutex nail polish remover. I have been using this brand for as long as I have been applying nail polish and that is a very long time (don't let my age fool you). With a wide range to choose from, I went for the ultra quick nail polish remover as I have mentioned before I do get quite impatient. Another favourite from the Cutex is the moisturising nail polish remover, I often alternate between the two types. 2. Once your nails are clean, it's time to cut and shape them. I always keep mine short, I guess it is what's convenient for me at the moment. I am a big fan of the almond shaped nails and hopefully I will be giving them a try in the near future. 3. For the next five minutes soak your hands in warm soapy water. Whilst your hands are soaking begin to gently massage your cuticles. This feels amazing and you will find yourself begging to keep them in for longer but all good things come to an end. 4. Dry your hands and push each cuticle back. The safest way to do this is with the correct equipment. Nail care sets are easy to find and are often quite affordable. I also think that they are great to give as gifts. 5. Moisturising your hands is important, for this I used the Oh So Heavenly Happy Hands Creamy Caress. It is a twenty-four hour moisture hand nail cream. 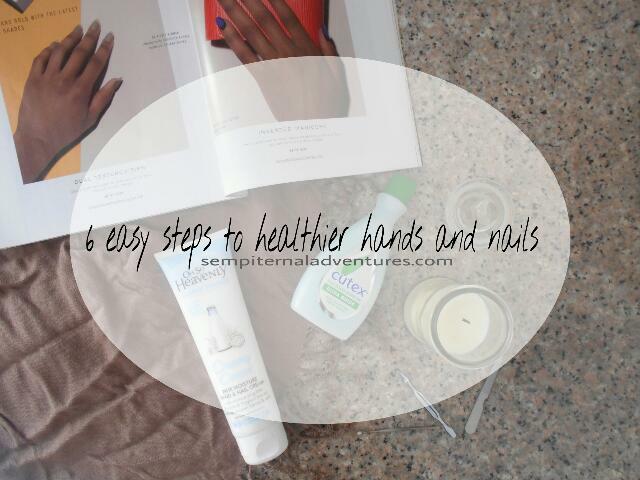 It helps nourish your nails and give them healthy look and feel. It contains milk proteins and yoghurt extract and leaves your hands feeling hydrated without leaving them greasy. 6. The final step is optional, one your manicure is comple you can apply a transparent nail polish or any other desired colour. I hope you found this post helpful. How often do you treat yourself to a manicure?